A quick single card post. 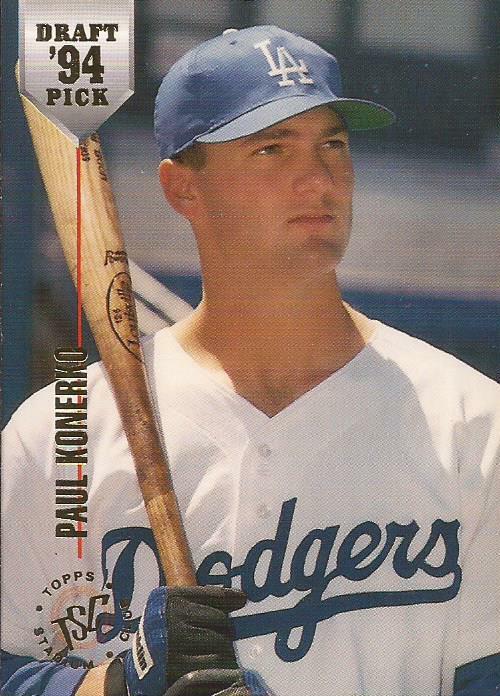 For two quarters I scored this '94 Stadium Club of Sox star Paul Konekro. Look at that yute! 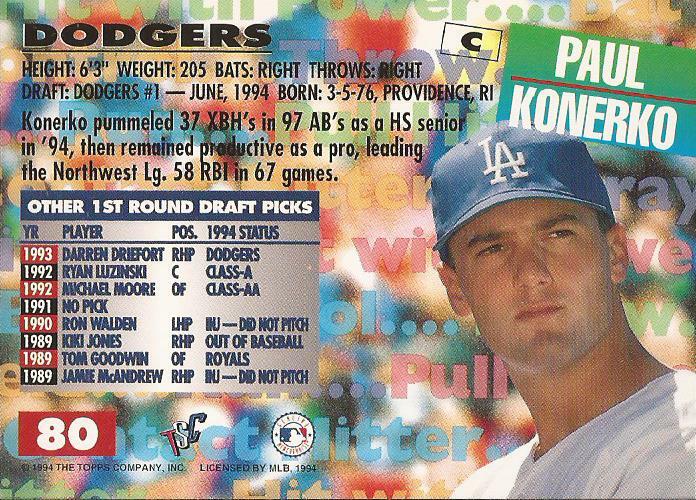 If this is a photo from 1994, and no reason it's not, he is an 18 year old fresh face in the Dodger organization. I think that is a blank jersey - I would think we should see a slight speck of the red numerals, though they may sit a little lower than I think. But I bring your attention to the back of the card. We all can laugh at the bad draft picks our favorite clubs had in the 90's. In 1994, the White Sox picked Mark Johnson as the 26th pick of round 1. Exactly - who? Konerko was taken at lucky number 13 for the Dodgers in 1994. How would you Dodgers fans have have felt if your club had the guy picked #12 by the BoSox? That is one fresh faced catcher, Paulie! Nomar at short instead of the likes of Kevin Elster and Alex Cora? I'd have been ok with that. Oh man... this set brings back some memories. I busted a ton of this product in search for a 1st day issue of Ben Grieve. Never pulled it, but I did pull the 1st day issue of this card.